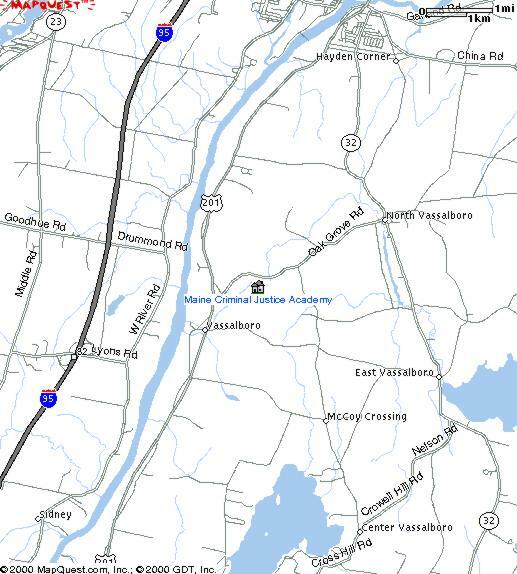 The Maine Criminal Justice Academy is located off Route 201 in Vassalboro. It is approximately 7 miles south of the Town of Winslow and 12 miles north of the City of Augusta. From the south: Take Interstate 95 north to Exit 113. Travel to the second set of traffic lights and turn left (north) onto Route 201. Follow Route 201 north for approximately 11 miles. The Academy will be visible on your right. From the north: Take Interstate 95 south to Exit 127, old exit 33, (Kennedy Memorial Drive). At the end of the ramp, turn left and follow the KMD into town. Where Route 137 turns off to the right (after 7th street light) turn onto Route 137. Proceed approximately 1.5 miles to the interection of Route 201. Turn right onto Route 201. Follow Route 201 for exactly 5 miles to intersection with the Oak Grove Road on the left. Academy is the set of brick buildings on the right.